Copy turning is an area of turning that is often thought of as the domain of the professional turner. It is avoided by many amateurs with the statement, "I only want to turn bowls", but it is, however, the keystone to all turning. Every cut that is made is repeated every time we turn on the lathe to make anything. Repeating these cuts and techniques allows us to gain satisfaction from producing the best type of cut possible from our tools and reducing the amount of time spent abrading our work. 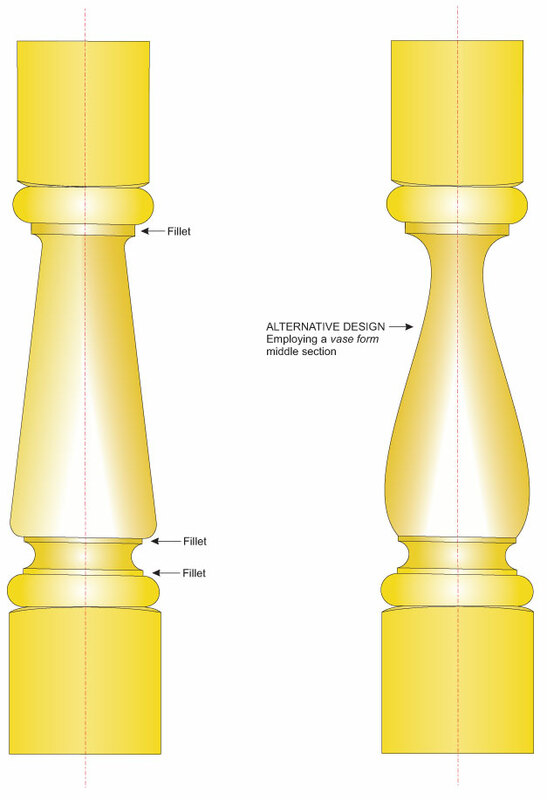 In this article I hope to guide you through a simple spindle, working from a sample or plan. Essential advice I always give to any student is that you should always have a clear idea in mind before you enter the workshop. For me, this was easy; one of my clients gave us a coffee table for Christmas, so Jane decided we needed a matching footstool. When making components for furniture a major consideration is where the pummel cut starts and finishes. Leave enough space to make joints and allow for the rails to be fitted. When staining furniture, you may be able to do less sanding than when finishing a bowl. But do spindles require reverse sanding and raising the grain to give a more even application of stains and finishes? Generally the answer is 'yes'. Reverse sanding stumped me to begin with, until I thought about it. The answer is so easy! You do not need a lathe that runs in reverse, just use a matched pair of drive (live) centres, then remove the spindle from between centres and swap it end-for-end. Turn on the lathe and the timber runs in the opposite direction. I use steb centres as they give a better drive, having many teeth to grip the wood. Use these on dry wood only because if you try using them on wet timber they will slip, losing drive. There is a different type of satisfaction at the end of turning a batch of hand-turned spindles. I find it enjoyable and rewarding knowing that my components are going to contribute in the making of new or reproduction furniture, maybe even antiques of the future. After all, how many hand-turned wooden bowls do we see on the Antiques Roadshow? When working with spindles the usual safety issues apply. Protect your eyes and lungs at all times and work at a speed that you feel is safe and comfortable. The components that support the workpiece when it is held between the headstock and tailstock - hence the term 'turning between centres'. 'Centres' is the generic term that encompasses four prong and two prong drives, steb centres, revolving centres, cone centres and ring centres. There are also specialist centres for specific purposes, for example, lightpull drive centres. The picture, from left to right shows a 2 prong drive centre, a revolving or live centre and a four prong drive. An extremely useful tool but has a reputation for being difficult to control. Certainly you can get some nasty catches with it but it is worth mastering. It is used mainly in spindle work and produces a very fine finish from the tool, requiring little, if any sanding. Planing cuts, peeling cuts and slicing cuts can be made with the skew as well as turning beads, coves and 'V' cuts. Typically, the cutting edge is ground at 60 degrees to the axis of the tool - hence the term 'skew' and the tool has two bevels whose inclusive angle is anywhere between 25 and 45 degrees. Skews are now made in three styles - rectangular section, oval section and rolled edge section. Modern day spindle gouges are made in the same way as bowl gouges - from a round bar of M2 high speed steel with the flute milled out. The flute is shallower and more open than that of a bowl gouge. Traditionally spindles gouges were forged from a flat, rectangular sectioned bar and some manufacturers have started making a modern day version of this, commonly known as the Continental Style spindle gouge. Like their name suggests, spindle gouges are used to cut details such as beads, coves and fillets on spindle work. This gouge is semicircular in section and the bevel is ground at between 35 and 45 degrees. The cutting edge is usually ground straight across. It is normally used in spindle or between centres turning for reducing a square blank to a round section - known as roughing down. This gouge is commonly known as a roughing gouge, but is more accurately described as a Spindle Roughing Gouge as it must not be used on faceplate work, e.g. for turning bowls. Like the headstock, this is normally made from cast iron or fabricated in steel. It is designed to slide along the bed and be clamped to the bed in its chosen position. The method of clamping it varies between manufacturers, but a common clamping method is by means of a cam locking assembly. The tailstock houses the quill or barrel, which in turn houses a revolving centre, allowing spindle work to be supported. "When making components for furniture a major consideration is where the pummel cut starts and finishes"